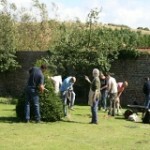 Since beginning in 2010, we have been busy working on many aspects of the gardens. We have been helped in these works by many organisations, to whom we are very grateful. 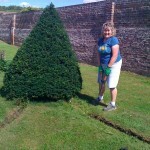 Volunteers have helped us trim the ornamental yew trees, clear the formal runnels, and mow the grass. 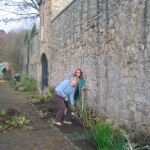 We have planted fruit trees along the walls, growing on newly-installed trellises. 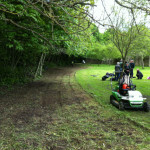 Thanks to Cllrs Dennis Southwell and Les Thompson for providing funding for a lawn mower. 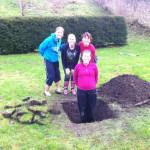 Thanks to volunteers from Durham University Business School. 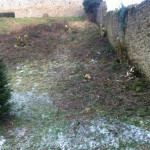 With the help of volunteers and donations, we have pruned the fruit trees, and replaced any which were dead or diseased. 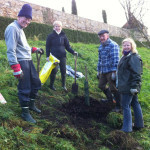 Thanks to the Durham AAP for funding for the replacement trees. 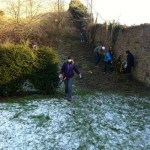 Thanks to volunteers from Durham University Business School, Northumbria Water, Durham University Conservation Group, King’s Church and Durham Countryside Rangers. 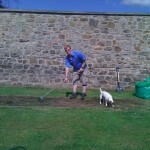 As well as the fruit trees, we have replaced some of the plants missing from the formal borders. 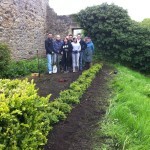 Thanks to volunteers from Barclay’s Bank. Following redevelopment works, we were given four benches from the market place in Durham. Thanks to Carillion for donating and installing the benches. We now have electricity, water and a toilet for volunteers. Despite lying alongside a footpath, the gardens are easily missed by passing walkers and cyclists. We have installed two new entrance signs to make the gardens more prominent. Thanks to Cllrs Dennis Southwell and Les Thompson for providing funding for these signs. These signs make the most of our new branding, designed by students from New College Durham. Although the orchard has always been, and will remain to be, open to the public at all times, the walled garden lay closed for many years. We now regularly open this garden to the public. 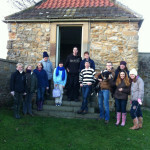 Over the past few years, we have organised and ran successful events, with the help of volunteers.